Our range of wooden packaging boxes is widely used for packing of wide range of highly marketed products. Finest quality wood is used to manufacture the boxes ensuring of their durability. These wooden boxes are widely accepted for their characteristics including leak proof, durability, environment friendly, hygienic and dust free. These are highly in demand among various industries such as pharmaceutical, food and others to keep the packed item safe and dust free. 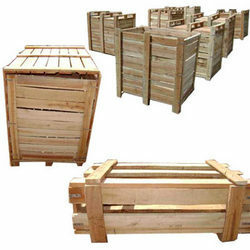 we are located at prime location in Gurgaon and cater to industrial requirement of wooden pallets, wooden boxes, and wooden packaging requirement in Gurgaon, Delhi, IMT Manesar, Bawal, Dharuhera, Bhiwadi, Alwar, Neemrana, Chaupanki, Faridabad, Noida, Kundli, Sonipat and other industrial areas like Dera bassi, kanpur, Rohtak, Baddi ( Himachal Pardesh), Rudrapur ( Uttrakhand). Jai Packaging Industries was established in the year 2005 and since then it has been at the forefront for delivering exclusive printed corrugated boxes, corrugated storage boxes etc. And much of the credit for this success goes to the vigil & sophisticated guidance of our CEO, Vinay Kumar. Our quality assurance is guaranteed by the constant monitoring and review of stern practices, policies, and procedures. Our printed corrugated boxes are really true epitome of our extensive knowledge and experience; as well as our dedication to their specific demands and objectives. We always keep tab on with modern trends and incorporate them in our product line from time to time. Our wooden packaging boxes and pallets are very durable and known exclusively for their unique feature i.e. to keep packaged products safe. We follow high quality standards and use special packaging for safe transportation of our delicate products across the country. All these attributes have made us an enchanted die cut boxes manufacturer and one of the successful suppliers from India.